The Indianapolis Colts have hired Sanjay Lal as the team’s wide receivers coach. Lal has spent 10 seasons in the NFL ranks, including the last two years as Buffalo’s wide receivers coach. Last year, Bills wide receivers accounted for 11 touchdowns. In 2015, Sammy Watkins recorded his first 1,000-yard campaign and led the NFL in average yards at the point of the catch (14.7). After returning from injury, Watkins finished the second half of the season ranked third in the NFL in receiving yards (900) from Weeks 9 to 17. Prior to arriving in Buffalo, Lal spent three seasons (2012-14) with the New York Jets and coached Eric Decker who posted 74 catches for 962 yards and five touchdowns in 2014. In 2013, he guided Jeremy Kerley and David Nelson who finished first and second on the team in receptions respectively. Kerley also posted a career-best 56 receptions in addition to 827 yards and a 14.8 yards per catch average in 2012. Lal spent five seasons (2007-2011) with the Oakland Raiders as the assistant wide receivers/quality control coach (2007-08) and wide receivers coach (2009-2011). While in Oakland, Raiders wide receivers finished sixth in the NFL with an average of 15.0 yards per catch. Denarius Moore ended the 2011 season with an 18.7 yards per reception average, which was the fourth-highest total among all wide receivers in the NFL. In 2010, he coached one of the youngest wide receiver units in the NFL, as no Oakland receiver entered the year with more than three seasons of pro experience. Lal helped rookie Jacoby Ford average 18.8 yards per catch. Lal was the offensive assistant and quarterbacks coach at the University of California for three seasons before joining the NFL. The Golden Bears played in a bowl game in each of his three years and captured a share of the school’s first Pac-10 title in 2006. Lal was the quarterbacks and strength, speed and conditioning coach at Saint Mary’s college in 2004 and was the wide receivers coach at Los Medanos College in 2003. Lal attended the University of Washington where he played wide receiver and became a Husky Hall of Fame selection. He was on Washington’s 1992 National Championship team and a member of two Rose Bowl teams. Lal was invited to training camp with the Raiders in 1995 and also spent time with the St. Louis Rams in 1998. He signed with the Scottish Claymores of NFL Europe in 1999. Lal replaces Lee Hull, who served as the team’s wide receivers coach last season. The Indianapolis Colts today signed safety Lee Hightower to a reserve/future contract. Hightower, 6-2, 200 pounds, spent time on the Colts and Washington Redskins practice squads last season. He participated in training camp with Indianapolis in 2016 before being waived during final cuts on September 3. Collegiately, Hightower played in 20 games (seven starts) in two seasons (2014-15) at the University of Houston and finished with 65 tackles (40 solo), 0.5 tackles for loss, two interceptions, five passes defensed and one forced fumble. Prior to transferring to Houston, he started 11-of-15 games at Boise State from 2011-12 and registered 56 tackles, 4.0 tackles for loss, one interception and five passes defensed. The Indianapolis Colts today signed outside linebacker Alex Bazzie to a reserve/future contract. Bazzie, 6-2, 240 pounds, spent the last three years (2014-16) with the BC Lions of the Canadian Football League. He played in 50 games and totaled 83 tackles, 29.0 sacks, two forced fumbles and eight special teams stops. In 2016, Bazzie started all 18 games and tallied 31 tackles, 4.0 tackles for loss, 11.0 sacks and one forced fumble. In the playoffs, he started in the Western Semi-Final and Western Final at defensive end. Bazzie earned his first career West Division All-Star selection as his sack total led the team and ranked fourth in the league. He saw action in 15 games in 2015 and led the Lions with 8.0 sacks, while adding 18 tackles and six special teams stops. Bazzie notched three tackles in the Western Semi-Final playoff game. As a rookie in 2014, he appeared in 17 games and recorded 34 tackles, 10.0 sacks, one forced fumble and two special teams stops. Bazzie led the team with 9.0 tackles for loss and became just the third player in franchise history to register 10.0 or more sacks in their debut season. He originally signed with BC as a free agent in May 2014. Collegiately, Bazzie played in 45 games at Marshall and totaled 109 tackles, 10.0 tackles for loss and 2.0 sacks. He was born in Liberia and moved to Maryland when he was five years old. The Indianapolis Colts today signed kicker Devon Bell to a reserve/future contract. Bell, 6-2, 190 pounds, participated in the Detroit Lions 2016 offseason program and training camp before being waived on August 29. He originally signed with the Lions as an undrafted free agent on June 2, 2016. Collegiately, Bell appeared in 50 games at Mississippi State and served as a punter, placekicker and kickoff specialist. In 2015, he played in all 13 games, serving as the primary kickoff specialist, and averaged 62.1 yards per kickoff. Bell also punted nine times for 370 yards (41.1 avg.). He saw action in 11 games in 2014 and served as the primary punter. In 2013, Bell split time between kicking and punting before claiming the primary punter role. He appeared in all 13 games and finished third on the team with 43 points. Bell broke the school record for the most points scored (85) by a kicker in a year in Bulldogs history as a freshman in 2012. He also set the school’s single-season record for extra points made and attempted (43-of-44). The NFL today announced that Indianapolis Colts outside linebacker Robert Mathis has been named the AFC Defensive Player of the Week for Week 17. This marks the fifth time he has earned the award in his career (Week 7 in 2005, Week 13 in 2008, Week 16 in 2011 and Week 16 in 2015). Mathis is now tied with Dwight Freeney for the most Defensive Player of the Week Awards in franchise history. In the Colts 24-20 victory over the Jacksonville Jaguars, Mathis compiled three solo tackles, 1.0 sack, one forced fumble and one fumble recovery in his final game as a member of the Indianapolis Colts. He logged a sack-forced fumble in the fourth quarter to stall a Jaguars scoring drive. On the play, Mathis passed Dwight Freeney (122.5) for the 17th most sacks in NFL history. Mathis ended his career with an NFL record 47 sack-forced fumbles and sacked 62 different quarterbacks. Mathis competed in 192 career games (120 starts), which is tied with Justin Snow for the seventh most games played in Colts history. His 14 seasons with the team are tied for the second most all-time in franchise history with Peyton Manning (1998-2011) and Reggie Wayne (2001-2014). Johnny Unitas (1956-1972) is the leader with 17 seasons. Mathis finished his career as the franchise leader in sacks with 123.0. He holds the Colts single season record for sacks with 19.5 in 2013, which also led the league that year. Mathis earned the inaugural Deacon Jones Award as the NFL’s sack leader. He was also named an Associated Press and Sporting News First Team NFL All-Pro selection in addition to being named to the 2013 PFWA All-NFL and All-AFC teams and the NFL 101 AFC Defensive Player of the Year. Mathis finished his career with 604 tackles, 18 passes defensed, 52 forced fumbles, 17 fumble recoveries, one interception and three fumble recoveries for touchdowns. Mathis is the first Colts player to earn AFC Defensive Player of the Week honors this season. Kicker Adam Vinatieri was named AFC Special Teams Player of the Week (Week 5) and Month (October), while running back Jordan Todman also earned AFC Special Teams Player of the Week (Week 9) accolades. Quarterback Andrew Luck was also named AFC Offensive Player of the Week (Week 13) this season. The last time a Colts player earned AFC Defensive Player of the Week honors was Mathis in Week 16 of the 2015 season. The Indianapolis Colts today signed cornerback Larry Scott to a reserve/future contract. Scott, 5-11, 194 pounds, participated in the San Diego Chargers’ 2016 offseason program and training camp before being waived during final cuts on September 3. He originally signed with the Chargers as an undrafted free agent on May 2, 2016. Collegiately, Scott played in 31 games at Oregon State and totaled 72 tackles (44 solo), 4.0 tackles for loss, one interception, one forced fumble and 15 passes defensed. In 2015, he started all seven games he appeared in and finished with 20 tackles (11 solo), 2.0 tackles for loss and three passes defensed. Scott started all 12 games in 2014 and led the Beavers with 11 passes defensed while adding 43 tackles (28 solo) and 2.0 tackles for loss. As a sophomore in 2013, he saw action in 12 games and tallied nine tackles (five solo), one interception, one pass defensed and one forced fumble. Scott was limited in 2012 while recovering from an injury that forced him to redshirt as a true freshman in 2011. The Indianapolis Colts today signed seven players to reserve/future contracts including: outside linebacker Lavar Edwards, wide receiver Marcus Leak, safety Stefan McClure, cornerback Tevin Mitchel, quarterback Stephen Morris, guard Adam Redmond and wide receiver Tevaun Smith. Edwards, 6-4, 275 pounds, spent time on the Colts active roster and practice squad in 2016. He played in five games for Indianapolis and tallied four tackles (three solo) and 1.0 sack after being claimed by the team off waivers on October 19, 2016. Edwards saw action in five games for the Carolina Panthers earlier this season before being waived on October 18. He has appeared in 22 career NFL games (one start) and totaled 21 tackles (14 solo), 2.0 sacks and two passes defensed. Edwards was originally selected by the Tennessee Titans in the fifth round (142nd overall) of the 2013 NFL Draft out of LSU. Leak, 6-0, 210 pounds, spent the final seven weeks of the season on Indianapolis’ practice squad. He was elevated to the Colts active roster from the practice squad on November 8, 2016 and waived on November 15. Leak also spent Weeks 7-9 on Indianapolis’ practice squad. He participated in the Colts’ 2016 offseason program and training camp before being waived on August 22. Leak originally signed with Indianapolis as an undrafted free agent on May 2, 2016. In three seasons at the University of Maryland, he played in 27 games (16 starts) and totaled 55 receptions for 775 yards and six touchdowns. McClure, 5-11, 205 pounds, spent the last four weeks of the season on the Colts practice squad. He participated in Indianapolis’ 2016 offseason program and training camp before being waived during final cuts on September 3. McClure originally signed with the Colts as an undrafted free agent on May 2, 2016. Collegiately, he appeared in 37 games (28 starts) at California and totaled 165 tackles, 7.5 tackles for loss, 1.0 sack, two interceptions, 12 passes defensed and three fumble recoveries (one returned for a touchdown). McClure was the only player in Golden Bears history to serve as a team captain for three seasons. Mitchel, 6-0, 190 pounds, spent the final nine weeks of the season on the Colts practice squad. He participated in Indianapolis’ 2016 offseason program and training camp before being placed on the team’s Injured Reserve list on September 3, 2016. Mitchel was waived from the Injured Reserve list on September 8 after reaching an injury settlement with the team. He was originally claimed by Indianapolis off waivers from the Washington Redskins on August 6, 2015. Mitchel spent the entire 2015 season on the Colts Injured Reserve list. He was selected by the Redskins in the sixth round (182nd overall) of the 2015 NFL Draft out of Arkansas. Collegiately, Mitchel played in 42 games (29 starts) for the Razorbacks and finished with 157 tackles, 6.0 tackles for loss, 18 passes defensed, two forced fumbles, one fumble recovery and four interceptions (one returned for a touchdown). Morris, 6-2, 218 pounds, spent time on the Colts active roster and practice squad in 2016. He participated in Indianapolis’ 2016 offseason program and training camp before being waived on September 7 and signed to the practice squad the following day. Morris was signed to the Colts 53-man roster off of the Philadelphia Eagles practice squad on December 24, 2015. He spent most of the 2015 season on the Eagles practice squad. In 2014, Morris spent most of his rookie season on the Jacksonville Jaguars practice squad before being elevated to the 53-man roster for the last two weeks of the season. He originally signed with the Jaguars as an undrafted free agent on May 12, 2014 out of Miami (FL). Redmond, 6-6, 290 pounds, spent most of the season on the Colts practice squad. He participated in Indianapolis’ 2016 offseason program and training camp before being waived during final cuts on September 3. Redmond originally signed with the Colts as an undrafted free agent on May 2, 2016. Collegiately, he played in 31 games at Harvard and was the co-recipient of the school’s William Paine LaCroix Trophy in 2015. Redmond was also named to the CoSIDA Academic All-District first-team and was selected to the All-Ivy League first-team. Smith, 6-2, 205 pounds, spent time on the Colts active roster and practice squad in 2016. He saw action in Week 7 at Tennessee and Week 8 vs. Kansas City. Smith participated in Indianapolis’ 2016 offseason program and training camp before being waived during final cuts on September 3. He originally signed with the Colts as an undrafted free agent on May 2, 2016. Collegiately, Smith totaled 102 catches for 1,500 yards (14.7 avg.) and seven touchdowns in 47 career games (24 starts) at Iowa. INDIANAPOLIS – The 2016 season came to a close on Sunday for the Colts in a 24-20 comeback victory over the Jaguars. Down 17-0, the Colts salvaged a .500 season with Andrew Luck leading his 18th career-game winning touchdown drive. The Colts (8-8) finished 2016 in third place in the AFC South and missed the playoffs for a second straight season. MATHIS FINAL DANCE – In a fitting way to cap his 14-year career, Robert Mathis found his way into one more strip/sack on Sunday. It was the 47th career strip/sack for Mathis, padding his NFL record. It was an emotional afternoon for Mathis as he concluded a career that started as an undersized fifth-round pick in 2003 out of Alabama A&M. COLTS REBOUND FROM “HORRENDOUS” START – Down 17-0 in Sunday’s second quarter, the Colts were looking at being swept by the Jaguars for just the second time in franchise history. After a “non repeatable” halftime speech, the Colts got back into the game with two touchdowns in the third quarter. Andrew Luck led a final-minute touchdown drive with Andrew Luck going 6-of-6 for 70 yards and a one-yard TD toss to the reliable Jack Doyle with 14 seconds left. 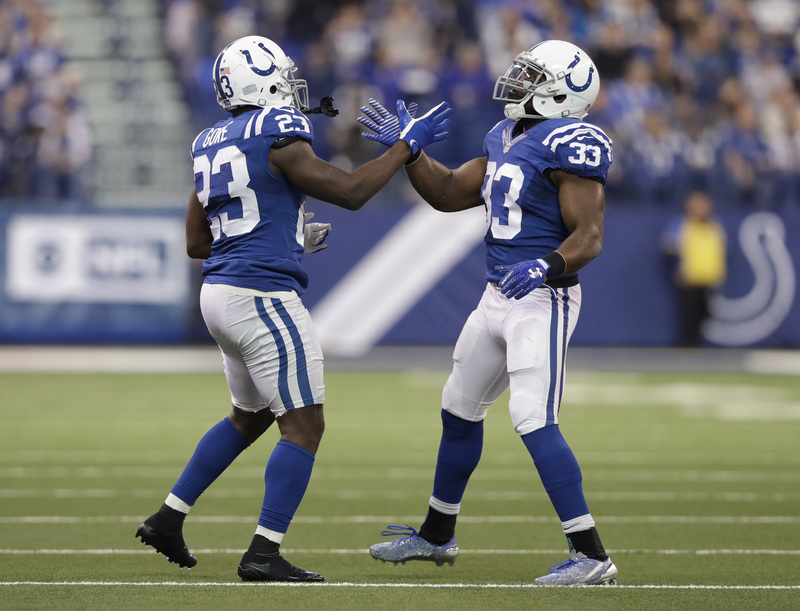 GORE, HILTON REACH MILESTONES – The big individual milestones coming into Week 17 were reached by the Colts. Frank Gore’s 62 rushing yards gave him 1,025 for the season. He became the first Colt since 2007 to reach 1,000 yards. T.Y. Hilton won the NFL’s receiving title, finishing the season with a career-high 1,445 receiving yards. RUN DEFENSE ISSUES – Without D’Qwell Jackson in closing the regular season, the run defense really struggled. The Jaguars piled up 182 rushing yards and averaged 6.1 yards per carry. This comes a week after the Colts allowed Oakland to run for more than 200 yards. OFF-SEAOSN WATCH – The Colts will gather on Monday for the final time this season. Meetings and locker clean out will signify the end of the 2016 campaign for the Colts. There will be plenty of questions for the Colts to answer in 2017 as the team will be trying to avoid missing the playoffs for a third straight season. This week’s “Back-Up of the Game” presented by Venyu is running back Robert Turbin. If we were picking a yearlong winner for this award, Turbin would have to be the vote. No player on the Indy roster this year filled his role better than the fifth-year running back. Whether it’s short yardage, pass protecting on third down or making plays in the passing game, Turbin has finally given the Colts a productive backup running back. In Sunday’s win over the Jaguars, Turbin once again found the end zone while excelling in short yardage situations. Turbin finished 2016 with seven rushing touchdowns and one receiving score. It’s going to be a very interesting off-season for Turbin. When Turbin signed a one-year deal with the Colts last spring, he expressed a desire to one day become a starting running. Well, with Frank Gore still under contract, a chance at that in Indianapolis appears to be on hold through 2017. The question for Turbin now becomes what does the open market look like for him. If there are no realistic starting chances elsewhere, the fit in Indy was pretty seamless in 2016.